Friends are asking me to post examples of enlightened leadership from the Ramayana, the ancient Indian epic that is freakily relevant for our times. The first thing I’d like to share is Rama’s response to a refugee crisis. At this point in the epic, he is about to fight Ravana, the demon king, who not only terrorizes the people but has stolen Rama’s devoted wife Sita. 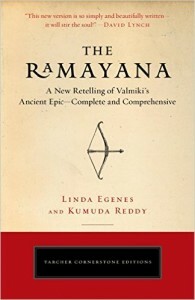 Suddenly, Vibhishina, the brother of the demon king, appears in Rama’s camp seeking refuge. Although his brother Ravana is a demon, Vibhishina is a high-souled being who has tried to stop his brother from his destructive ways, and has been driven from his own kingdom for speaking up. He has nowhere else to go, plus he wants to help Rama and fight on the side of truth. When Rama consults his ministers, all but the wise Hanuman advise Rama to kill Vibhishana before he kills them. who seek refuge in me. 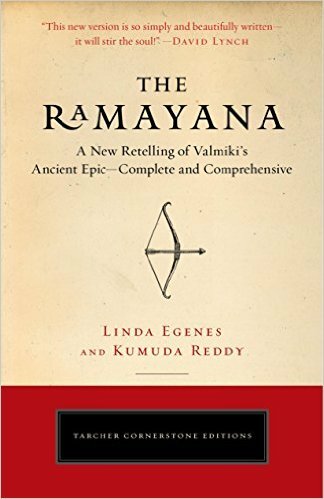 Excerpted from The Ramayana: A New Retelling of Valmiki’s Ancient Epic—Complete and Comprehensive by Linda Egenes and Kumuda Reddy (Tarcher Perigee, a division of Penguin Random House), 2016.